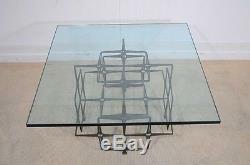 Vintage Mid Century Modern Masonry Nail Steel Brutalist Coffee Table Paul Evans Era. PLEASE READ THE ENTIRE LISTING. 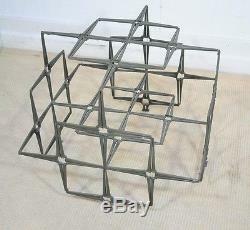 Unique Vintage Brutalist Coffee Table Constructed of Welded Steel Masonry Nails and a Thick Square Glass Top in the Paul Evans Style. 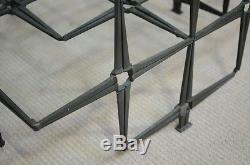 Features army green finish to the steel nails, geometric sculpted base, beautiful. 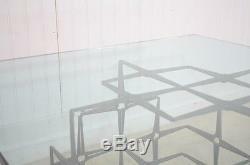 75 thick square glass top, and great modernist lines. 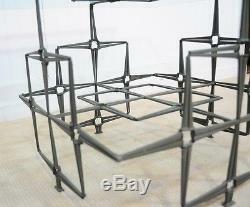 16.25" H , 29.75" W x 29.75 D. Base : 15.5"h x 19"w x 19d. 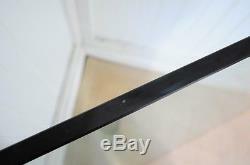 Item is in very good vintage condition being structurally sound and sturdy with minor small rubs and dings to the finish on the nails. 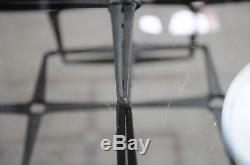 The glass is in very good vintage condition with only the very smallest nick to the edge as pictured in image # 14 below. Additional images embedded within item description, please review all images below. I have added many images so you can get the best idea of its beauty and condition and supersize all images for great detail. Please keep in mind that we offer vintage and pre-owned items that can show normal signs of use including some surface scratches and dings here and there. All items can be viewed in person at our showroom in Philadelphia, PA 19124. WE WOULD LOVE FOR YOU TO VISIT OUR SHOWROOM BY APPOINTMENT WHICH IS LOCATED IN PHILADELPHIA, PA ZIP CODE 19124. All payments must be received within 10 calendar days of the listing end date unless prior arrangements are made. We pride ourselves with providing high quality pictures and descriptions and will be happy to answer any specific questions you may have about an item. 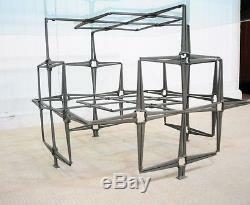 We do our best to offer high quality items that we would be more than happy to display in our own homes. Here you will find some of the best designs in the industry from rosewood to lucite, teak and Rare exotic woods. 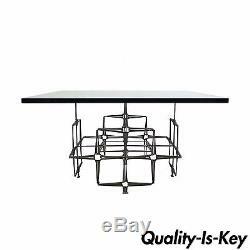 Some of the industries leading names can be found right here including Ethan Allen, Baker, Kittinger, Henkel Harris, Herman Miller, Paul Evans, Curtis Jere, Dux, Finn Juhl, Milo Baughman etc. Take a look around because I'm sure we have something you wont find anywhere else! Many times a response will be made within the hour as we check our messages quite frequently. 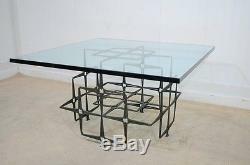 The item "Vtg Trimark Mid Century Modern Nail Brutalist Coffee Table Green Paul Evans Styl" is in sale since Monday, March 25, 2013. 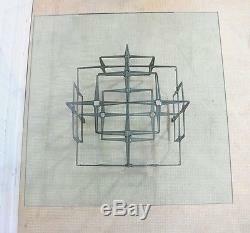 This item is in the category "Antiques\Furniture\Tables\Post-1950". 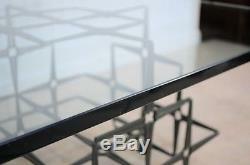 The seller is "quality-is-key" and is located in Philadelphia, Pennsylvania.